The Abu Garcia Handline and Rig is perfect for going on holiday and is a quick and fun way for you to fish off a slow moving boat or pier without using a rod and reel. This handline and rig set up is great for holiday goers and is also perfect for kids too! You can use this from a boat at slow speeds, the beach, the pier or off some rocks as well. The handline and rig has a durable construction and is made from high quality components as you would expect from Abu Garcia. 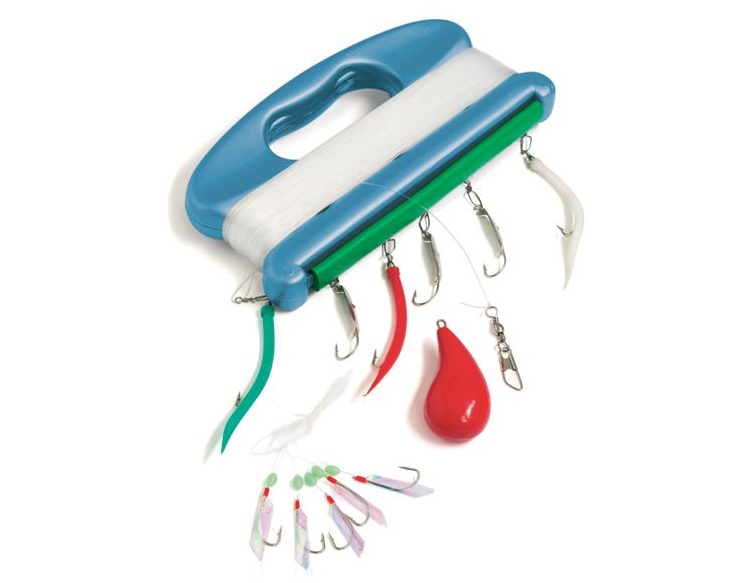 To use, simply lower down and unravel the line to drop into the water and you’re away fishing! This is also a great way to get extra lines out whilst fishing with a rod and reel, without using multiple rods. The Abu Garcia Handline and Rig is complete with hooks, line and lure rig feathers and is supplied in a plastic pouch. Looking to buy some Rigs for sea fishing as part of a fishing gift? If you would like some advice on purchasing Rigs for sea fishing, simply contact our expert fishing team, giving us either an email or phone number on which to contact you and we'll get back to you right away with the best advice and prices. FREE Delivery on all Abu Garcia Rigs for sea fishing over £100!! !